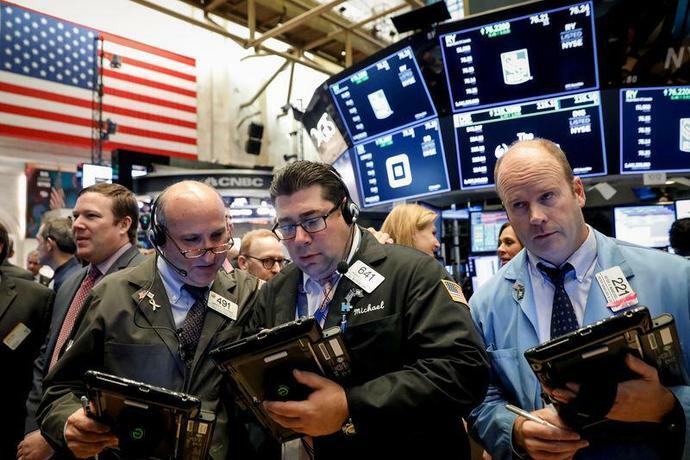 (Reuters) - U.S. stocks fell on Wednesday, a day after Wall Street's strongest rally in seven months, as investors were disappointed with IBM's results and remained cautious ahead of the minutes of Federal Reserve's latest meeting. Shares of IBM dropped 6.3 percent after the company's quarterly revenue fell more than expected, pointing to a bumpy recovery for the member of the Dow Jones Industrial Average. Technology stocks led declines among the seven of 11 major S&P sectors that were lower. IBM's results follow strong reports from other Dow members such as Goldman Sachs, UnitedHealth and Johnson & Johnson, which helped U.S. stocks jump more than 2 percent on Tuesday to claw back some losses from the recent selloff. The selloff last week was mainly driven by worries over how corporate profit would be affected by tariffs, growing wages, rising interest rates and an increasingly hawkish Fed, which President Donald Trump called "my biggest threat". The minutes of the Fed's September policy meeting, at which it raised rates for the third time this year, is due at 2:00 p.m. ET (1800 GMT). Since the meeting, a string of strong economic data has prompted Fed policymakers to say they expect to continue a rate-hike cycle that began in late 2015. "The (stock) indices are pulling back after yesterday's blockbuster earnings rally that is likely to be challenged by the Fed's FOMC minutes," said Peter Cardillo, chief market economist at Spartan Capital Securities in New York. However, Randy Frederick, vice president of trading and derivatives for Charles Schwab in Austin, said the content of the Fed minutes is already known. "Every now and then there might be a comment or an anecdote which we didn't know about and the market might have made a quick reaction to it but generally it is a short-lived move." At 9:57 a.m. EDT the Dow Jones Industrial Average was down 172.06 points, or 0.67 percent, at 25,626.36, the S&P 500 was down 8.19 points, or 0.29 percent, at 2,801.73 and the Nasdaq Composite was down 19.74 points, or 0.26 percent, at 7,625.75. Shares of housing and construction material companies fell after data showed U.S. homebuilding dropped more than expected in September as construction activity in the South fell by the most in nearly three years. The PHLX housing index slid 1.79 percent. United Airlines shares climbed 5.1 percent after a solid third-quarter profit and again raising it 2018 outlook. That also lifted American Airlines, Delta Air Lines, Southwest Airlines and JetBlue Airways between 1 percent and 2.9 percent. The struggling semiconductor sector got a lift after industry bellwether ASML Holding NV's bullish results and outlook eased fears of slackening demand. ASML's U.S. shares rose 3.6 percent, while other chip gear makers such as LAM Research, Applied Material and KLA Tencor rose between 1.5 percent and 3.1 percent. Advancing issues outnumbered decliners by a 5.16-to-1 ratio on the NYSE and a 2.44-to-1 ratio on the Nasdaq. The S&P index recorded five new 52-week highs and six new lows, while the Nasdaq recorded six new highs and 33 new lows. After Pinterest&apos;s initial public offering Thursday, the company&apos;s stock price rose more than 28%. Asian shares were subdued on Thursday after a negative performance on Wall Street, with caution ahead of business surveys in Europe and Japan, and the Good Friday and Easter holidays keeping investors on the sidelines. MSCI's broadest index of Asia-Pacific shares outside Japan inched up 0.08 percent, trading just below its highest since late July 2018 brushed on Wednesday. Australian shares advanced a quarter of a percent while Japan's Nikkei was a shade lower. Stocks around the globe fell on Wednesday as a continued flight from healthcare shares dragged on Wall Street, overshadowing upbeat economic data from China. The S&P 500 dipped as the healthcare index dived 2.9% to erase its year-to-date gains on continued fallout from concerns about potential changes to U.S. policy, including a "Medicare for All" proposal by Senator Bernie Sanders. The decline in U.S. stocks weighed on MSCI's 47-country world index, which was buoyed earlier by better-than-expected Chinese data showing the country's economy grew 6.4% in the first quarter.